2008.02.18 Look for footage of the BlinkenMac in the upcoming feature documentary MacHEADS! Meanwhile, Get one while they last! 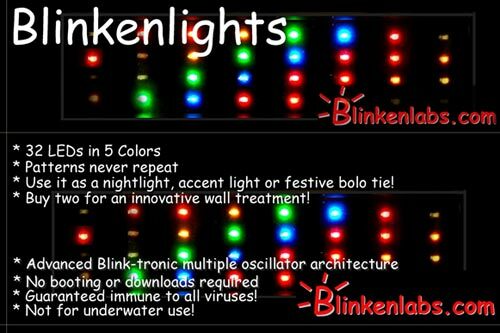 2007.02.16After feverishly working for 3 years to bring this fine product to market, the first shipment of Das Blinkenlights Model 100 has finally arrived and is now available for purchase! Get one while they last! Mmmh wait, how about a perfectly geeky gift? 2006.12.28 The first box of 30 Das Blinkenlights arrived from Shen-Zhen, just in time for Christmas, almost... air-freight costs more than the product... but, great colors on the LEDs! Use it as a nightlight, accent light, festive tree topper, or bolo tie! Buy two for an innovative wall treatment! No booting or downloads required! Guaranteed immune to all viruses! It's a polychromatic retinal stimulator! It's a chromohypnotic temporal pattern generator! It's a hypnophotonic optical massage unit! It's a photochromatic modulation relaxation device! It's a chromotherapeutic stimulation simulator! It's an interstellar communication signaling beacon... Not! William Shakespeare, John Steinbeck, George W. Bush, Bob Dylan, The Bible, Ann Coulter, Henry D. Thoreau: what do they have in common? They all want to be read, heard and seen. And so do Homer, Homer Simpson and the Rolling Stones. Now you can enjoy them all from your iScroller™! Or perhaps you are like us, whenever you want to pull out that joke that makes everybody laugh, your memory goes blank. Not with the iScroller™! Introductory price is a lousy $99. So what are you waiting for? Order your very own iScroller™ here and have fun everafter.